And then, someone (more that one someone) told me that yoga is sinful. They seemed like they knew so much about it. I heard that the poses were offerings to false gods, I heard that it was based on false, eastern religions. I heard that Christianity and yoga were mutually exclusive. And then I heard otherwise … so what to believe? So, finally, I just made my own call. I love yoga. I know that God healed me from anorexia–it was all Him–and I also know that yoga was a big part of that. But truthfully, I didn’t tell a lot of people about my home practice. I wasn’t sure how to defend it. I wasn’t prepared to be criticized for my decision. Enter, a podcast that I stumbled upon today: Faithful Wellness interviewed Brooke Boon, the founder of Holy Yoga, and it made sense! Rather than try to restate everything that Brooke said with such clarity, I’ll simply post the podcast and link here for you. 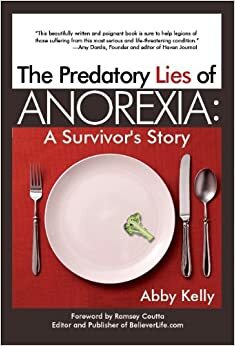 This blog started as a chronicle of my recovery from anorexia then, it hosted the launch of my book: The Predatory Lies of Anorexia, so it only seems fitting that it continue to proclaim Christ, freedom, health, hope and clarity to those who are looking for freedom from body image, weight issues and eating disorders. Not really into yoga, but i am into gymnastics, and in order to learn to be flexible again i have watched yoga videos on youtube. but i am soooo lazy that i can only do maybe 2 min of gymnastics at a time. It is so hard to know the desire of God sometimes. The devil is so good at what he does. I don’t have a deep knowing on this; when in doubt, don’t is where I stand with it. The healer I train with is adamant about the dangers of yoga–shared some devastating stories of captivity–and praise God, healing. He presents the Seven Chakras (sp?) as doors for unholy spirits…and that ‘opening the 7th Chakra’ is equated with ‘losing one’s mind.’ I’ve only read a little and share because I believe God is able to keep us and direct us…He gives us wisdom as we seek it. I know you adore the Savior and rest in His guidance. I love your sharing and love knowing I can share back without worrying about offending. You are a treasure in my world, sister! Billie Jo, I love you too. Yes, I was of that persuasion for a long, long time. If you get the chance to listen to the podcast I linked in, this Christian woman did make me rethink what I’ve heard before. And that’s what it was for me–only what I’ve heard. I’ve never done any research on it myself. Even what Brooke says is just what I’ve now heard–but, when I hear her heart for the Lord Jesus, I trust her. I did listen…I believe she is wholly convinced. Her history of yoga doesn’t line up with the research I have done. And theologically there are some things that I question. One of the places I did some reading is here: http://www.lighthousetrailsresearch.com/blog/?p=12147. The other escapes me at the moment…it researched the depths. If you want it, I will dig it out. If not that is fine too. love ya! I’ll definitely read the link you sent. Thanks for being so caring, honest and open with me. I’m glad you listened to the podcast, too. I too have read so many conflicting things before. I’m really interested in your thoughts! Love!